Table Top Glue Applicator for een spread of adhesive at a considerable saving of conumption upto 40% approximately. Suitable for PVA, Cold Glues in general and Hot Animal Glue upto 60oC to 70oC. Glue heating by radition through a thermostat control. Glue control through micrometeric scraper roller. Paper, Cloth, Buckrum & PVC etc upto 400gsm or 1mm thick meterial can be glued. Variable Speed drive enable wide range of materials to be processed. 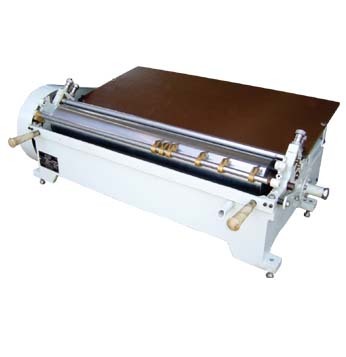 Manual feeding and rollers(adjustable) to cater to different gauge of materials. Stripper fingers assist in lifting the glued material.